This light, warm and spacious centrally located property is equipped to encourage fun and laughter, relaxation and large alfresco dining whilst having the convenience of unlimited WiFi, 2 separate TVs (each with their own DV player) and 3 toilets! Comfortably sleeping up to 10 people (all on quality beds) there is room for the whole family, with facilities to match, 2 bathrooms and an additional toilet in the garage. The property is equipped with unlimited WiFi, Apple TV, Infinity Gas hot water, 3 powerful heat pumps and even a carpeted games room in the garage including a pool table, dart board and second TV/DVD player. The lounge has a retro influence and includes a turntable (complete with an interesting vinyl collection), some classic old school board games, card games (including poker) and a rubik's cube to intrigue the younger generation. This bach is equipped to cater for large gatherings around the table. Whether to be alfresco dining courtesy of the 6 burner BBQ and outdoor furniture or the extendable indoor dining suite - this bach has the large platters, tapas bowls and glassware to cope. The main bathroom is newly decorated and has both a bath and shower (with great water pressure). The bach has quality peaceful neighbours, (who are permanent Taupo residents) and are always happy to share some local knowledge. This fully fenced property will allow small to medium sized dogs with prior approval. 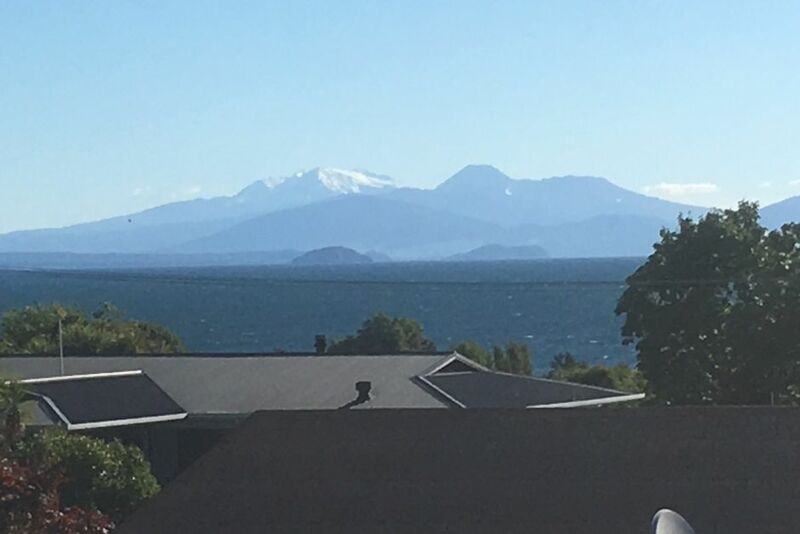 If you are coming to Taupo for a vacation or to participate in one of the many great events then this property provides a great option for you. Small to medium sized dogs allowed with prior approval. Stairs and upstairs deck is not suitable for toddlers/small children. Lovely house great location, very comfortable beds, plenty of room, would stay here again, thankyou. Property was fine for our family reunion, but have to admit that it is rather tired. Property was fine for our family reunion, but have to admit that it is rather tired. Curtains need attention, couldn’t get the TV working, light bulbs were out, fan in upstairs bathroom wasn’t working. But location was fine, and we had a fun time in the house. Cleaning was pretty basic. Nice clean house and property. Nice clean house and property. Excellent entertainment area in the garage at the back. Pool table, dart board etc big comfortable beds and rooms, plenty of plates for large groups. Would stay again!